Mish's Global Economic Trend Analysis: Investigating Consumer Confidence: 3-Month Low? 10-Month Low? Near Record High? 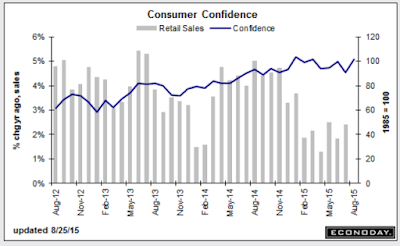 Investigating Consumer Confidence: 3-Month Low? 10-Month Low? Near Record High? Bloomberg states "Consumer sentiment is directly related to the strength of consumer spending." Let's investigate that claim starting with a look at the latest results from each survey. On August 25, the Conference Board's "Consumer Confidence Level" soared well ahead of any Bloomberg Consensus estimate with a reading Bloomberg stated "will have forecasters scratching their heads." Three days later, the University of Michigan release was another head-scratching event. Bloomberg reported Consumer Sentiment in U.S. Declines to a Three-Month Low. The University of Michigan sentiment number came in at 91.9, well below any guess in Bloomberg's Consensus Estimate Range of 92.7 to 95.0. In regards to consumer confidence, Bloomberg stated "The Yellen Fed has put great emphasis on the importance on consumer confidence readings and this report points to job-driven strength ahead for household spending." Let's compare Yellen's belief to reality. Bloomberg conveniently provided this chart. Here's a chart I put together last month on sentiment and sales. To be fair, one needs to look at per capita spending and factor in boomer dynamics such as aging, etc. However, I do not have access to the conference board data, and the University of Michigan data on Fred is out of date. Let's consider one more measure of sentiment. 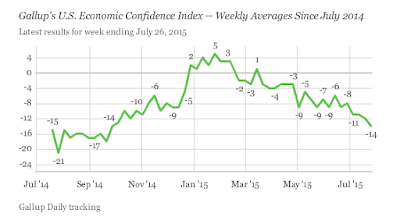 On July 28, Gallup reported U.S. Economic Confidence Index Continues Downward, at -14. Gallup's Economic Confidence Index continued its gradual, downward slide, reaching -14 for the week ending July 26. This represents a 10-month low for the index. Gallup: "Gallup is based on telephone interviews conducted July 20-26, 2015, on the Gallup U.S. Daily survey, with a random sample of 3,540 adults, aged 18 and older, living in all 50 U.S. states and the District of Columbia." Conference Board: "The Consumer Confidence Survey uses an address-based mail sample design. The CCS mailing is scheduled so that the questionnaires reach sample households on or about the first of each month. The targeted responding sample size—approximately 3,000 completed questionnaires—has remained essentially unchanged throughout the history of the CCI." 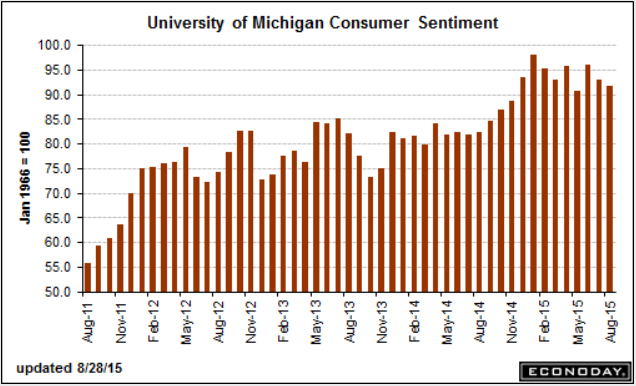 University of Michigan: The group surveyed 64 more people than usual in August in order to better capture the reaction to the market events, according to Richard Curtin, director of the Michigan Survey of Consumers. Typically, 500 consumers are polled every month. Do the difference in polling methods help explain the different results? Is it possible those responding to mail-in campaigns are economically better off and more likely to take the time to respond than those in phone surveys? Is survey language a factor? Reading comprehension? Do people give different answers on paper than they might over the phone? Is the University of Michigan sample size of 500 big enough to predict spending patterns for the entire nation? Gallup "Economic Confidence" is at a 10-month low. University of Michigan "Consumer Sentiment" is at a 3-month low. The Conference Board "Consumer Confidence Level" is at the second highest level in 8 years. The surveys are so out of line with each other, it is impossible that "sentiment" matches spending, no matter how one adjusts the data. In fact, the above charts are so screwy that one might wonder if it's possible to accurately measure sentiment at all. Assuming sentiment can be measured (and we have three different surveys that purportedly do just that), the usefulness of such wildly differing surveys is not readily apparent. Yellen can believe what she wants, but faith in sentiment as a leading indicator or purveyor of future economic spending patterns is seriously questionable, at best. Forced to select a single survey, I would go with a phone survey over a paper survey, and a large sample size over a smaller one - Gallup. By the way, the University of Michigan and Gallup surveys are at least going the same direction this year. The Conference Board survey is the odd man out.